9mobile keep unleashing super bonus for their subscribers and customers but this new offer tagged as "Super deal", has really got people attention towards the best leading telecommunications in Nigeria, 9mobile. 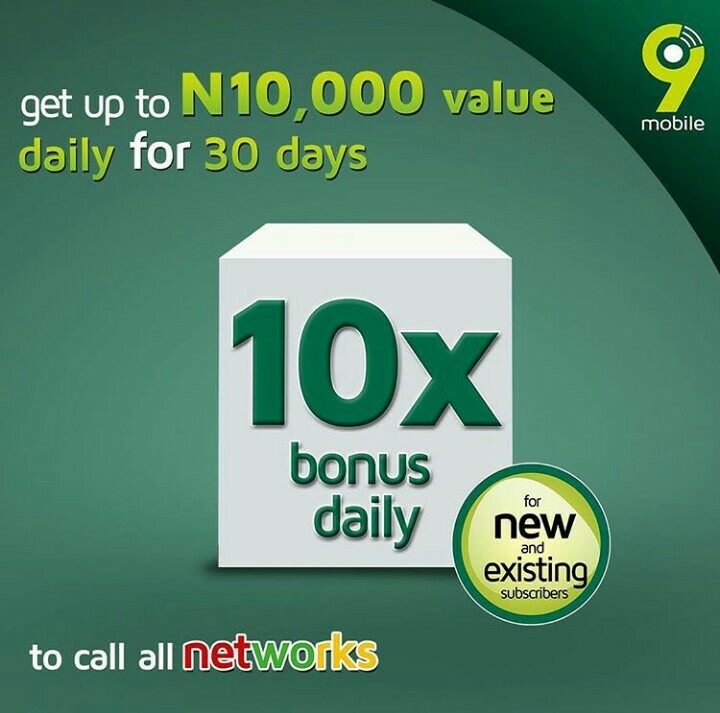 The super deal bonus gives users 10,000naira bonus on daily basis till 30 days. The bonus has been well advertised on radio, televisions, Facebook and many other media. Additionally, is available for the esteemed 9mobile old and new subscribers. New customers get up to 10 times the value of your recharge daily for voice and data and existing customers get 7 times the value of your recharge daily for 30 days. The voice call bonus can be used to call all networks in Nigeria. To activate the bonus, simply dial *819*1#. Existing customers must be on easystarter, easycliq, cliqlite, among others. Appreciate by sharing this post with friends using the share bottons below.